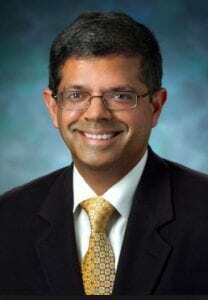 Rangaramanujam Kannan, PhD is a faculty of Ophthalmology, and co-director of the center. His degrees are in Chemical Engineering from Birla Institute of Technology and Science (Indian) (B.S.) and Cal Tech (Ph.D.), and he has completed a postdoctoral fellowship in Chemical Engineering at University of Minnesota . He worked as a senior research engineer at 3M Corporate Research Labs prior to beginning a faculty position at Wayne State University in Chemical and Engineering and Materials Science in 1997. At Wayne State, he served as Director of the Nanotechnology Lab at NICHA Perinatology Research Branch in Detroit, as well as co-Director of the Center for Active Nanostructures. He moved to Johns Hopkins University in 2011 to join the faculty at the Wilmer Eye Institute/Ophthalmology at the Johns Hopkins University School of Medicine. Dr. Kannan drives research interests in the area of nanomedicine, with a focus on targeted drug delivery using dendrimers. His translational research focuses on targeted therapy for neuroinflammation associated with cerebral palsy, retinal degeneration, autism and brain tumors and CNS disorders. He has initiated interdisciplinary translational research efforts in dendrimer-based drug delivery, involving chemists, engineers and clinicians. Dr. Kannan is an author of multiple patents and more than 60 peer-reviewed publications, and the chief technology officer of a tech start-up nanoScience Engineering Corporation. He is the winner of the National Science Foundation CAREER award and is an editorial board member of nanomedicine: nanotechnology, biology and medicine.